Bankruptcy asset sales of used ironing presses. Make your bid! 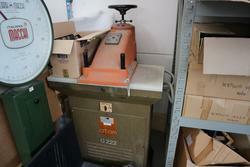 Are you looking for an used ironing press? You are on the right place! On Industrial Discount you will find a wide assortment of industrial ironing presses to iron jackets, pants, jeans and shirts, and even steam and rotary ironing presses. If you own a business in the textile industry, iron presses are surely essential for you. By attending our online auctions, you will be able to expand your ironing machining equipment with maximum savings! All the iron presses for sale on our website come from bankruptcy procedures; therefore they have a price much lower than their market value. Furthermore, thanks to the constant collaboration with the major Courts, we are able to offer you the utmost transparency and security in conducting our online auctions. Lastly, we personally test the condition of all used ironing machines before selling them. Take advantage of all the tools of our portal and attend our online auctions! Each item for sale is provided with a full description, technical specifications and high-quality photos. You will find in just a few clicks the used iron press that suits your needs: use the filters to show only the most relevant results, or perform a text search in the top search bar. Do you need any further information? Talk with us through our chat service on the website, we will be happy to answer all the questions you may have and, if necessary, we will personally follow you through each step of the auction. Attending the online auctions of used ironing presses is easy: register for free, follow the instructions to activate your account and make your first bid! You can either bid manually or activate the Proxy Bid, our automatic bidding system which raises your bids on your behalf, according to the maximum price you set, and allows you to engage easily in other activities. Don't wait any further: register now and make your bid to get your used ironing press at the cheapest price! 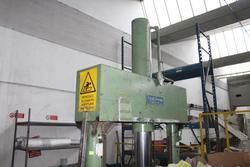 Do you want to stay updated about the upcoming auctions of used iron presses? Subscribe to our newsletter! You will receive a weekly email showing new items for sale.